The majority of the developed, American landscape has been crafted around automotive transport. As auto technology matured, increasing amounts of resources and area have been devoted to expanding and solidifying our road network. The result has often been environments that are built for a monoculture of cars and their passengers rather than an ecology of transit that supports a variety of mobility options. In order for our streetscapes to evolve to cater to pedestrians more than cars, so too must the car-oriented infrastructure evolve in what kinds of services it provides to its municipality. A broader array of roles can allow infrastructure to improve quality of life in multiple ways with systems that complement each other. A new proposal by design firm DCP highlights opportunities for the paved grid of roads and sidewalks to evolve into an ecology of functions that benefit residents and the environment. The site chosen for the study was South Mason Street, a main spine for community not only due to its central location to the city and CSU, but also because it is the home of an active freight rail track with trains passing by at least twice a day. Cars and trains currently hold a disproportionate presence in the composition of South Mason Street that make it more of a road for cars than a street for people. Instead of promoting a monoculture of cars, DCP likened the infrastructural landscape as more of a permaculture-based system. With roots based in agricultural growing practices, “permaculture” is the development of complementary, interconnected systems to form a productive ecology–not dissimilar from the goal of a vibrant streetscape. The proposed design applies permaculture principles to South Mason Street to replace its transit monoculture with the cultivation of a multi-modal ecology. 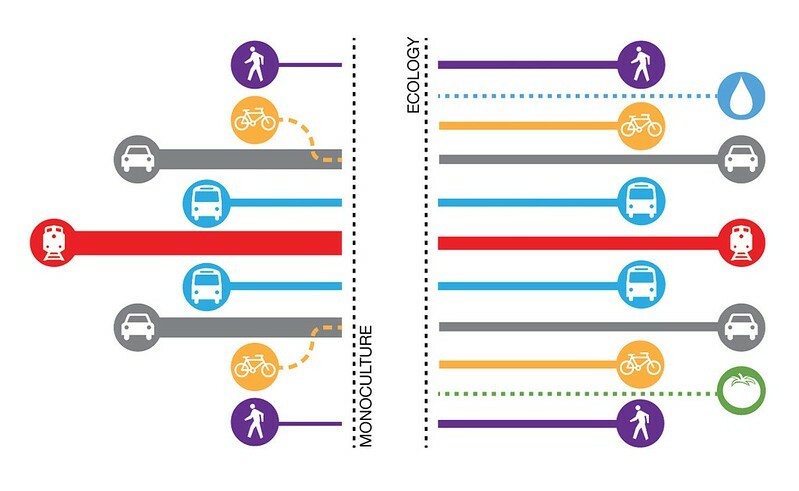 Area that has been doled out to high speed travel can be reclaimed for a more balanced distribution among multi-modal transit types to create a safe, walkable environment. Crafting new boundaries to the existing right-of-way could help decrease the sensory dominance that the train imparts on the street environment. A low screening element provides visual and acoustic dampening at the trains base and provides an additional layer of separation, aiding the pedestrian in returning focus to the walkable surroundings.